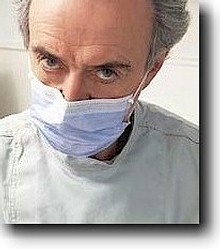 In this audio file Mr. MacEnroe goes to the dentist. He knows he should visit the dentist, but fear does keep him out of the dental chair because he is not very good at tolerating pain. First of all, listen just for a gist paying special attention to the specific words. Don't worry if there are some words you don't understand: you should be able to get the general idea without needing to use your dictionary. Listen once again and try to do this vocabulary activity. For questions 1-to-10 you have to choose the best alternative from the menus. Then check your answers.